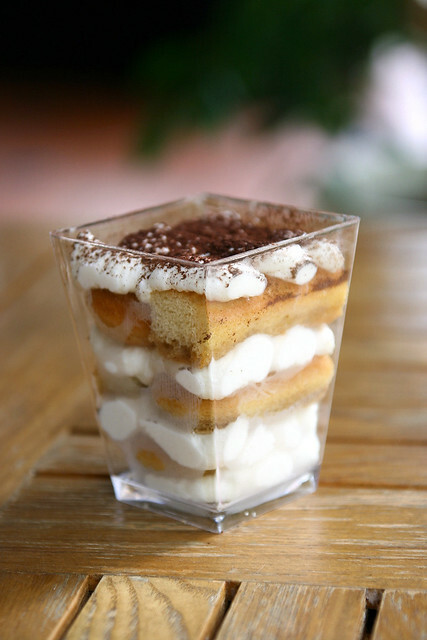 Bosch Verobar and Filtrino; Plus Eggless Tiramisu Recipe! 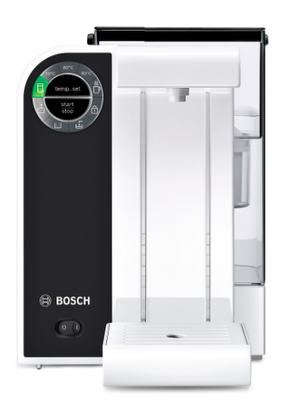 Bosch has two new machines for you to drool over this coming festive season. 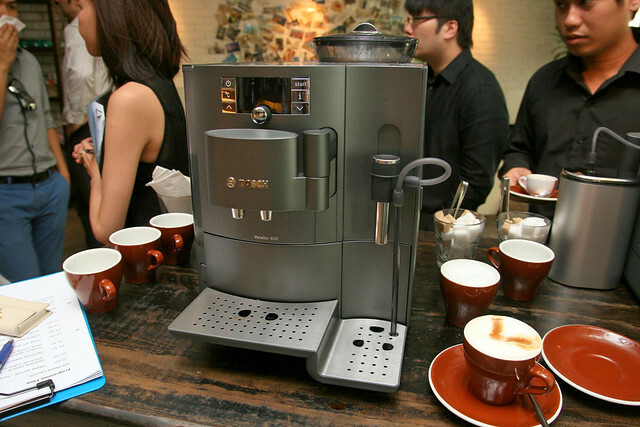 Firstly the ultra luxurious VeroBar that gives you barista-styled coffee in a matter of seconds, be it an espresso, lungo, cappucino or latte macchiato. Bosch teamed up with a coffee roastery to find out how to achieve the perfect crema and aroma in its espresso machines. It's really quiet, so that's great for offices too. Here's the silver model (the first one is titanium, I believe). Both very stylish with curved front panel in chrome and solid metal. The VeroBar is German-engineered to offer high standards of hygiene (because milk is involved and you don't want residues lingering in the pipes), convenience of use and maintenance. A stainless steel milk container holds a milk jar that detaches for storage in the fridge. The VeroBar is already in the stores. Prices from S$2,199. Ahhh...I can only dream. Hey, wait, there's a festive promo going on! 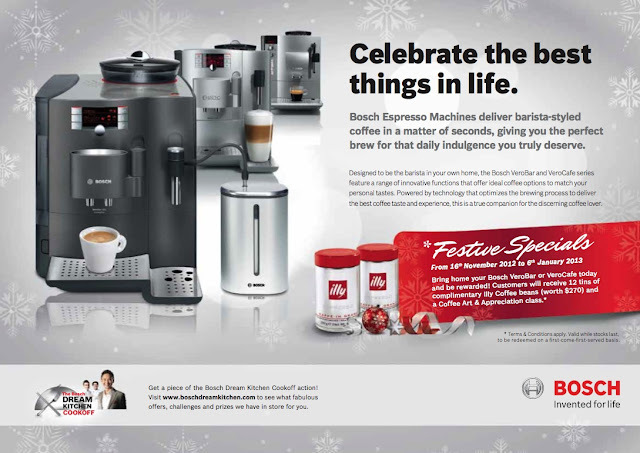 From now til 6 January 2013, you can bring home 12 tins of Illy Coffee beans (worth S$270) free! Click to see full size picture. The other one that has got me lemming is the Bosch Filtrino Hot Water Dispenser. This Red Dot Design Award Winner 2012 is a water filter and hot water dispenser in one. 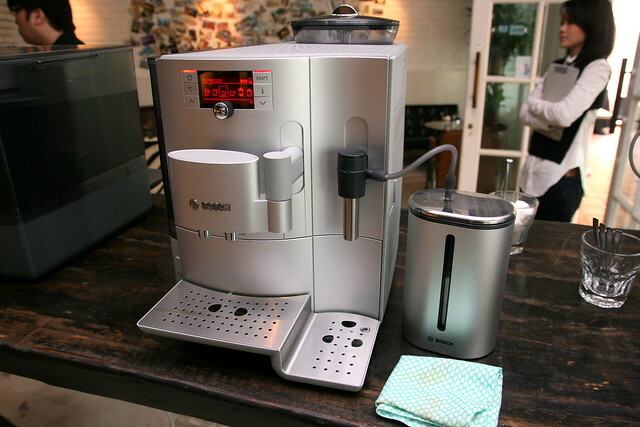 It offers five temperature settings so you can enjoy your favourite hot beverage at the optimum temperature: 70° C for white teas, 80° C for green teas and at boiling temperature for fruit, herbal and black teas. Instant coffee and hot chocolate mixes taste best with water at 90° C, while instant soups and noodles are best prepared with boiling water. Right now, I have a separate water filter jug. And my current hot water dispenser (which shall remain unnamed) only does three temperature settings, which I don't even think are accurate (my teas seem a bit weak). And it's almost sputtering to cough out water even when the indicator says it's three-quarters full. Why don't appliances work like they should? Sigh. This one sounds good also because it saves energy and time. Conventional air pots consume considerable energy with constant re-boiling, but the Bosch Filtrino only heats up the exact amount that is actually needed, saving up to 50 per cent of the usual electricity and time taken. The integrated BRITA MAXTRA filter helps improve the taste of water, and there's a child-proof lock to boot. It retails at S$279 at leading retail outlets island-wide, from 1st November 2012. 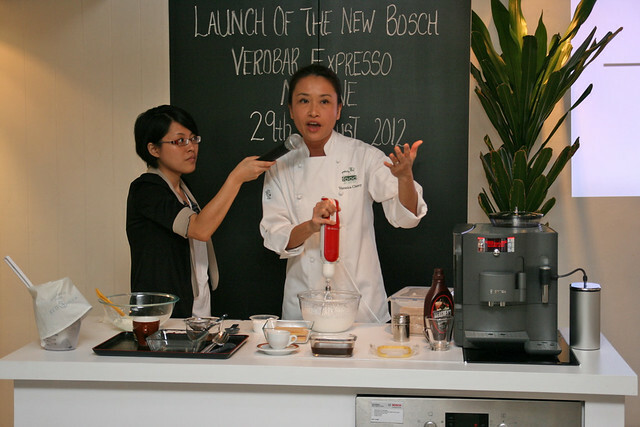 At the launch of the Bosch VeroBar, we had the pleasure of Chef Veronica Cherry from Food-To-Serve demonstrate to us an eggless tiramisu using the tasty and very strong espresso from the VeroBar machine. I thought I'd share with you the recipe. Thanks to Veronica for allowing me to publish it. 1. Prepare the strong espresso coffee, set aside to cool. Add the alcohol if using..
2. In a medium bowl, beat together the mascarpone cheese and 4 tbsp icing sugar until light and creamy. 3. In a separate bowl, whip the double cream and 4 tbsp of icing sugar until you get stiff peaks. Gently fold in the mascarpone cheese and set aside. 4. Lightly dip the sponge fingers into the coffee mixture. They should absorb just enough liquid without getting soggy and falling apart. 5. Arrange a single layer of soaked sponge fingers at the base of a dish. 6. Cover with a layer of mascarpone cream mixture. Continue layering alternately with sponge fingers and mascarpone cream, finishing with the latter. 7. Sprinkle with cocoa powder and chill in the refrigerator for at least 4 hours. Mr Duck is better for kway chap!